The M1 Abrams is a third-generation main battle tank produced in the United States. The M1 is named after General Creighton Abrams, former Army Chief of Staff and Commander of US military forces in Vietnam from 1968 to 1972. It is a well armed, heavily armored, and highly mobile tank designed for modern armored ground warfare. 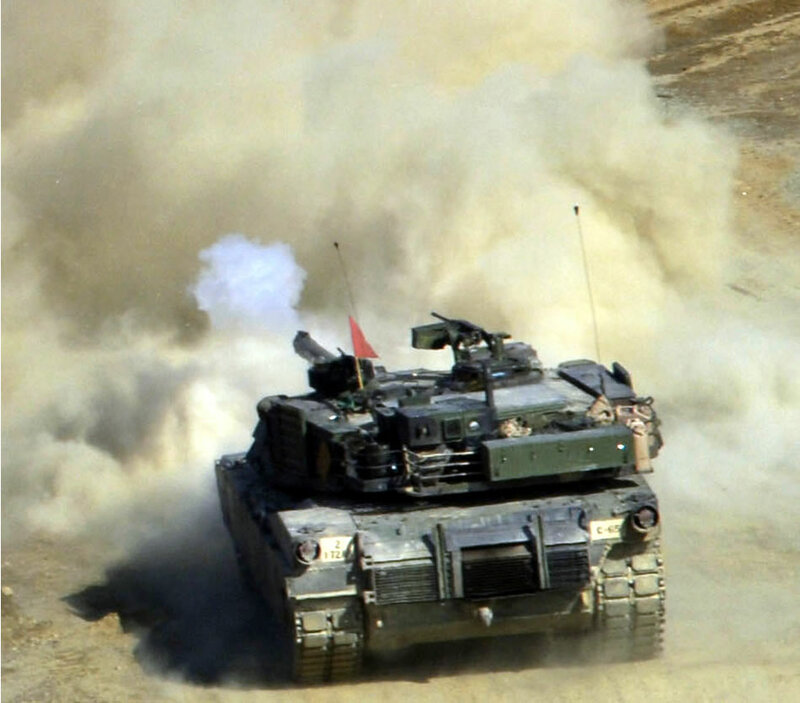 Notable features of the M1 Abrams include the use of a powerful gas turbine engine, the adoption of sophisticated composite armor, and separate ammunition storage in a blow-out compartment for crew safety. It is one of the heaviest tanks in service, weighing in at close to 68 short tons (almost 62 metric tons).The M1 Abrams entered U.S. service in 1980, replacing the 105 mm gun, full tracked M60 Patton. It did, however, serve for over a decade alongside the improved M60A3, which had entered service in 1978. Three main versions of the M1 Abrams have been deployed, the M1, M1A1, and M1A2, incorporating improved armament, protection and electronics. These improvements, as well as periodic upgrades to older tanks have allowed this long-serving vehicle to remain in front-line service. The M1A3 is currently under development. It is the principal main battle tank of the United States Army and Marine Corps, and the armies of Egypt, Kuwait, Saudi Arabia, Australia, and in 2010 Iraq. The M1 Abrams is anticipated to be in U.S. service until the 2050s, approximately 70 years after entering U.S. service. The first attempt to replace the aging M60 tank was the MBT-70, developed in partnership with West Germany in the 1960s. The MBT-70 was very ambitious, and had various ideas that ultimately proved unsuccessful. As a result of the imminent failure of this project, the U.S. Army introduced the XM803. This succeeded only in producing an expensive system with capabilities similar to the M60.Congress canceled the MBT-70 in November and XM803 December 1971, and redistributed the funds to the new XM815 later renamed the XM1 Abrams after General Creighton Abrams. Prototypes were delivered in 1976 by Chrysler Defense and General Motors armed with the license-built version of the 105 mm Royal Ordnance L7 gun along with a Leopard 2 for comparison. The Chrysler Defense design was selected for development as the M1. In 1979, General Dynamics Land Systems Division purchased Chrysler Defense.3273 M1 Abrams were produced 1979-85 and first entered US Army service in 1980. It was armed with the license-built version of the 105 mm Royal Ordnance L7 gun. An improved model called the M1IP was produced briefly in 1984 and contained small upgrades. 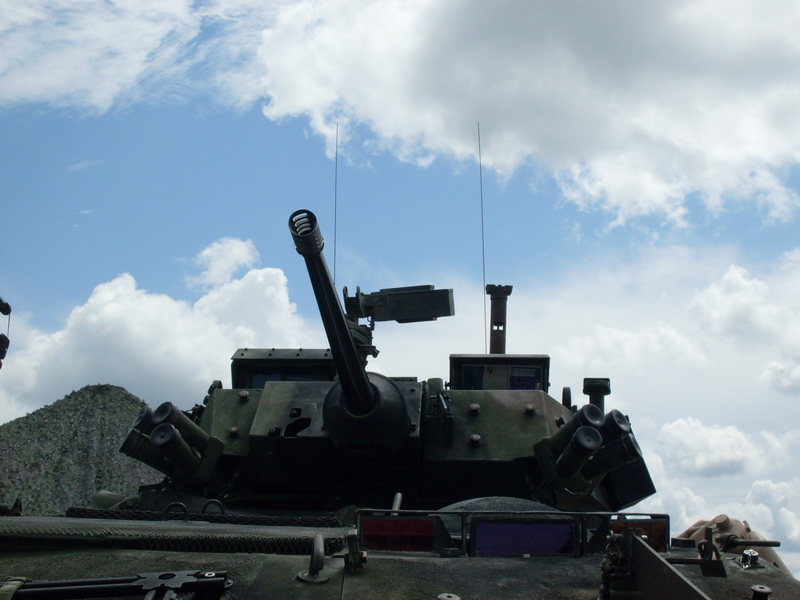 The M1IP models were used in the Canadian Army Trophy NATO tank gunnery competition in 1985 and 1987.About 6000 M1A1 Abrams were produced from 1986–92 and featured the M256 120 mm smoothbore cannon developed by Rheinmetall AG of Germany for the Leopard 2, improved armor, and a CBRN protection system. As the Abrams entered service in the 1980s, they would operate alongside M60A3 within the United States military, and with other NATO tanks in numerous Cold War exercises. These exercises usually took place in Western Europe, especially West Germany, but also in some other countries like South Korea. During such training, Abrams crews honed their skills for use against the men and equipment of the Soviet Union. 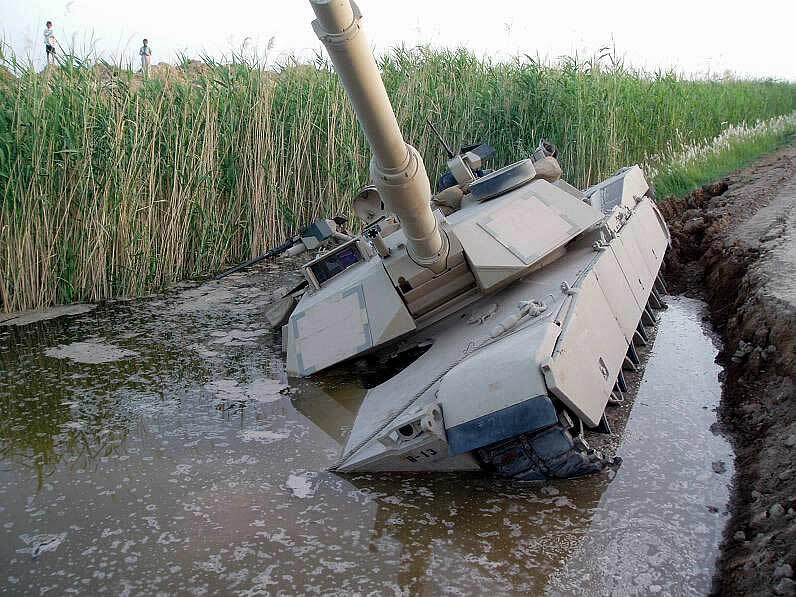 However, by 1991 the USSR had collapsed and the Abrams would have its trial by fire in the Middle East.The Abrams remained untested in combat until the Gulf War in 1991. A total of 1,848 M1A1s were deployed to Saudi Arabia. The M1A1 was superior to Iraq’s Soviet-era T-55 and T-62 tanks, as well as Iraqi-assembled Russian T-72s, and locally-produced copies (Asad Babil tank). The T-72s, like most Soviet export designs, lacked night vision systems and then-modern rangefinders, though they did have some night fighting tanks with older active infrared systems or floodlights—just not the latest starlight scopes and passive infrared scopes as on the Abrams. Only 23 M1A1s were taken out of service in the Gulf. Some others took minor combat damage, with little effect on their operational readiness. Very few Abrams tanks were hit by enemy fire, and there was only one fatality, along with a handful of woundings as a result. The M1A1 was capable of making kills at ranges in excess of 2,500 metres (8,200 ft). This range was crucial in combat against tanks of Soviet design in Desert Storm, as the effective range of the main gun in the Soviet/Iraqi tanks was less than 2,000 metres (6,600 ft) . This meant Abrams tanks could hit Iraqi tanks before the enemy got in range—a decisive advantage in this kind of combat. In friendly fire incidents, the front armor and fore side turret armor survived direct APFSDS hits from other M1A1s. This was not the case for the side armor of the hull and the rear armor of the turret, as both areas were penetrated at least in two occasions by friendly DU ammunition during the Battle of Norfolk. The M1A2 was a further improvement of the M1A1 with a commander’s independent thermal viewer and weapon station, position navigation equipment, digital data bus and a radio interface unit. 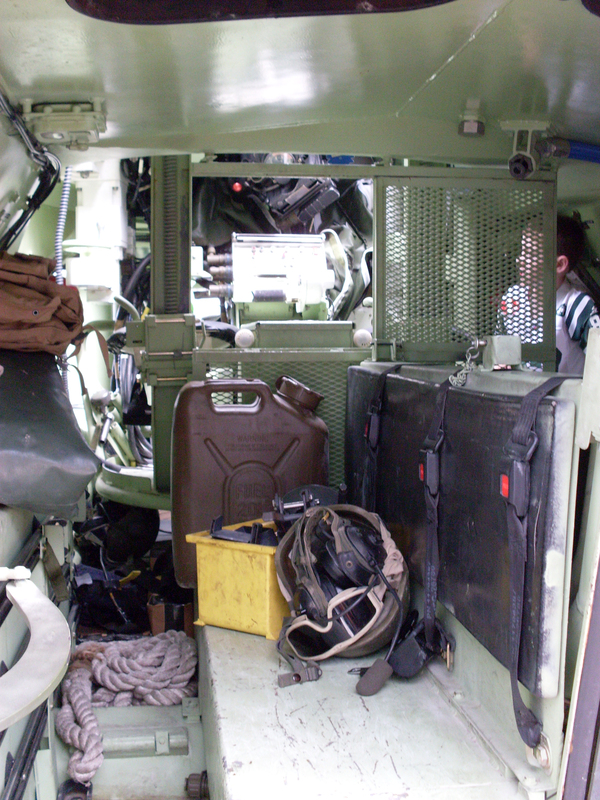 The M1A2 SEP (System Enhancement Package) added digital maps, FBCB2 (Force XXI Battlefield Command Brigade and Below) capabilities, and an improved cooling system to maintain crew compartment temperature with the addition of multiple computer systems to the M1A2 tank.Further upgrades included depleted uranium armor for all variants, a system overhaul that returns all A1s to like-new condition (M1A1 AIM), a digital enhancement package for the A1 (M1A1D), a commonality program to standardize parts between the U.S. Army and the Marine Corps (M1A1HC) and an electronic upgrade for the A2 (M1A2 SEP).During Operations Desert Shield and Desert Storm and for Bosnia, some M1A1s were modified with armor upgrades. The M1 can be equipped with mine plow and mine roller attachments if needed. 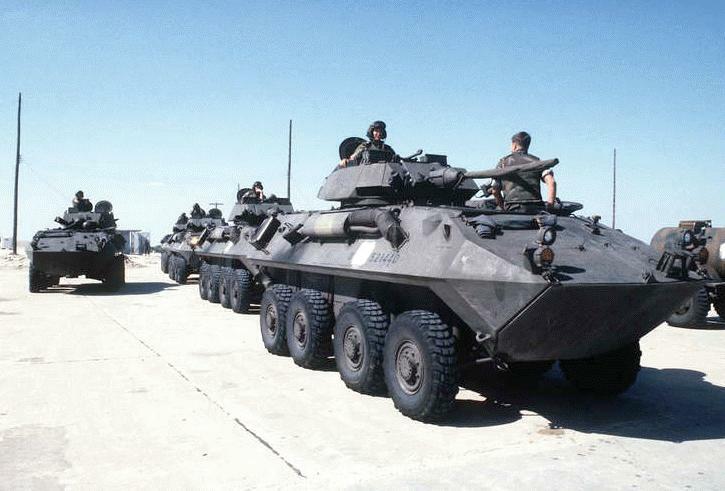 The M1 chassis also serves as a basis for the Grizzly combat engineering vehicle and the M104 Wolverine heavy assault bridge.Over 8,800 M1 and M1A1 tanks have been produced at a cost of US$2.35–$4.30 million per unit, depending on the variant. Further combat was seen during 2003 when US forces invaded Iraq and deposed the Iraqi leader Saddam Hussein. 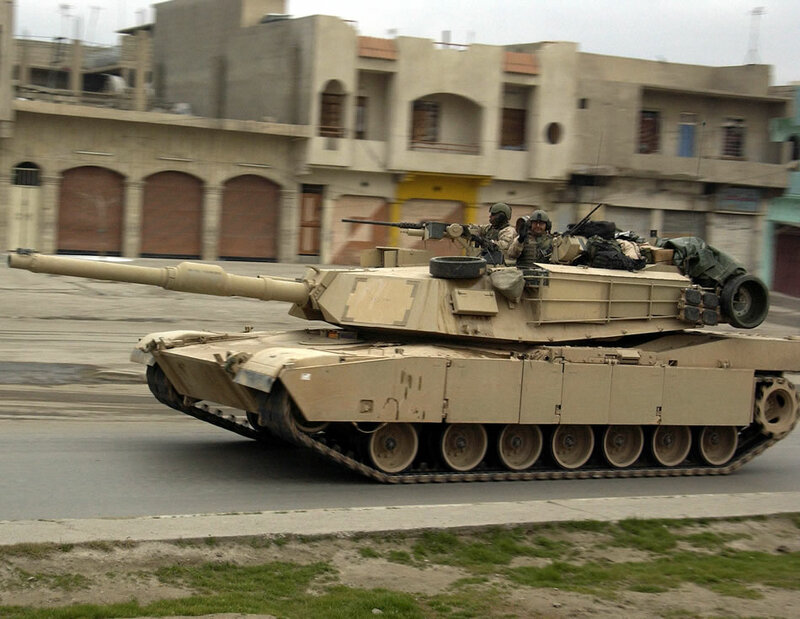 As of March 2005, approximately 80 Abrams tanks were forced out of action by enemy attacks. Nevertheless, the campaign saw very similar performance from the tank with no Abrams crew member being lost to hostile fire during the invasion of Iraq, although several tank crew members were later killed by roadside bombs during the occupation that followed.The most lopsided achievement of the M1A2s was the destruction of seven T-72 Lion of Babylon tanks in a point-blank skirmish (less than 50 yards ) near Mahmoudiyah, about 18 miles south of Baghdad, with no losses for the American side. In addition to the Abrams’ already heavy armament, some crews were also issued M136 AT4 shoulder-fired anti-tank weapons under the assumption that they might have to engage heavy armor in tight urban areas where the main gun could not be brought to bear. Following lessons learned in Desert Storm, the Abrams and many other US combat vehicles used in the conflict were fitted with Combat Identification Panels to reduce friendly fire incidents. These were fitted on the sides and rear of the turret, with flat panels equipped with a four-cornered ‘box’ image on either side of the turret front . Some Abrams were also fitted with a secondary storage bin on the back of the existing bustle rack on the rear of the turret referred to as a bustle rack extension to enable the crew to carry more supplies and personal belongings. Many Abrams (irrecoverable due to loss of mobility or other circumstances) were destroyed by friendly forces to prevent their capture, usually by other Abrams, who often found them very difficult to destroy despite their firepower.A majority of Abrams damaged post-invasion were by Improvised explosive devices.Some Abrams were disabled by Iraqi infantrymen in ambushes during the invasion. Some troops employed short-range anti-tank rockets and fired at the tracks, rear and top. 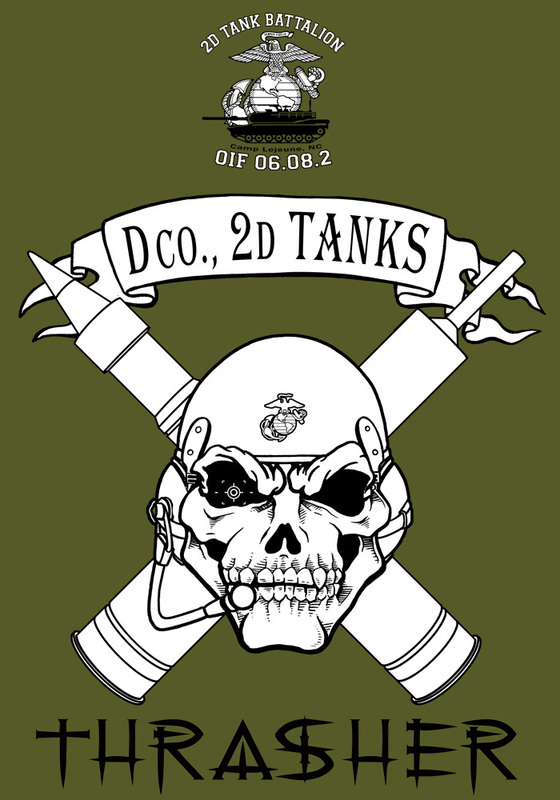 Other tanks were put out of action when struck in critical places by heavy machine gun rounds.Due to the vulnerability of tanks in urban combat, the Tank Urban Survival Kit, or TUSK, is being issued to some M1 Abrams. It is intended to improve fighting ability in urban environments. The M1A3 Abrams is in the early design period with the U.S. Army. The Army aims to build prototypes by 2014 and to begin to field the first combat-ready M1A3s by 2017. 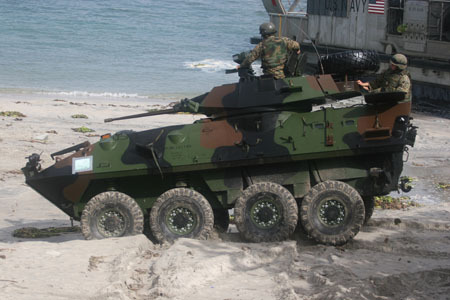 Unlike earlier US military vehicles from World War II through Vietnam, which used a scheme of dark brownish green known as “olive drab” with large white stars, prototypes and early production M1 (105 mm gun) & M1-IP models used the flat medium green paint; and the large white insignia stars have transitioned to much smaller black markings. 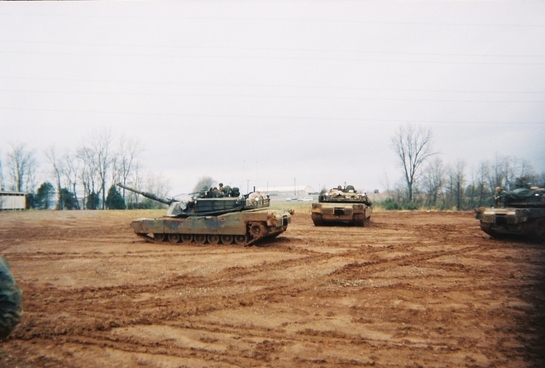 Some units painted their M1s with the older MERDC 4-color paint scheme but the turn-in requirements for these tanks required repainting them to solid green. Therefore, even though a large number of the base model M1s were camouflaged in the field, few or none exist today.M1A1s (120 mm gun) came from the factory with the NATO 3 color camouflage Black/Med-Green/Dark-Brown CARC paint jobs. Today M1A1s are given the NATO three color paint job during rebuilds. M1s and M1A1s deployed to Desert Storm were hastily painted desert tan. Some, but not all, of these tanks were re-painted to their “authorized” paint scheme. M1A2s built for Middle Eastern countries were painted in desert tan.Some M1 series tanks are being painted desert tan for service in Iraq and some are not. Replacement parts (roadwheels, armor skirt panels, drive sprockets, etc.) are painted overall green, which can sometimes lead to vehicles with a patchwork of green and desert tan parts. The turret is fitted with two six-barreled smoke grenade launchers (USMC M1A1s use an eight-barreled version). These can create a thick smoke that blocks both vision and thermal imaging, and can also be armed with chaff. The engine is also equipped with a smoke generator that is triggered by the driver. When activated, fuel is sprayed on the engine manifold, creating the thick smoke. However, due to change from diesel as a primary fuel to the use of JP-8, this system is disabled on most Abrams today, because JP-8 causes the tanks to catch fire when sprayed on the manifold. In addition to the advanced armor, some Abrams are equipped with a Missile Countermeasure Device that can impede the function of guidance systems of semi-active control line-of-sight (SACLOS) wire and radio guided anti-tank missiles (Russian AT-3, AT-4, AT-5, AT-6 and the like) and thermally and infrared guided missiles (ATGM). This device is mounted on the turret roof in front of the loader’s hatch, and can lead some people to mistake Abrams fitted with these devices for the M1A2 version, since the Commander’s Independent Thermal Viewer on the latter is mounted in the same place, though the MCD is box-shaped and fixed in place as opposed to cylindrical and rotating like the CITV. The Abrams is protected by armor based on the British-designed Chobham armor, a further development of the British ‘Burlington’ armor. Chobham is a composite armor formed by spacing multiple layers of various alloys of steel, ceramics, plastic composites, and kevlar, giving an estimated maximum (frontal turret) 1,320–1,620 millimetres (52–64 in) of RHAe versus HEAT (and other chemical energy rounds) and 940–960 mm (37–38 in) versus kinetic energy penetrators. It may also be fitted with reactive armor over the track skirts if needed (as in the Urban Survival Kit) and Slat armor over the rear of the tank and rear fuel cells to protect against ATGMs. Protection against spalling is provided by a Kevlar liner. Beginning in 1987, M1A1 tanks received improved armor packages that incorporated depleted uranium mesh in their armor at the front of the turret and the front of the hull. Armor reinforced in this manner offers significantly increased resistance towards all types of anti-tank weaponry, but at the expense of adding considerable weight to the tank, as depleted uranium is 1.7 times more dense than lead. The first M1A1 tanks to receive this upgrade were tanks stationed in Germany, since they were the first line of defense against the Soviet Union. 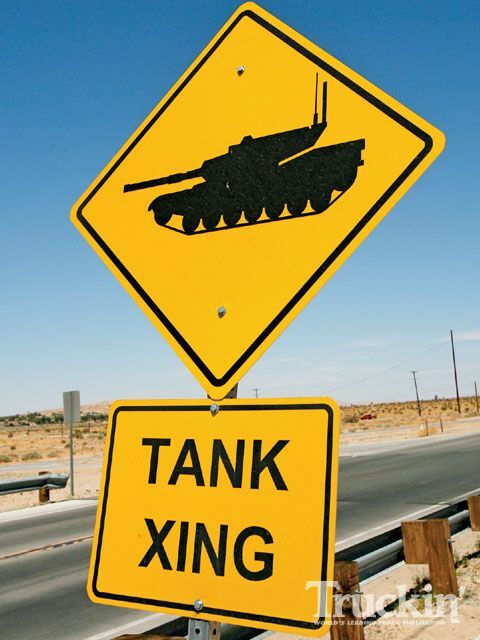 US-based tank battalions participating in Operation Desert Storm received an emergency program to upgrade their tanks with depleted uranium armor immediately before the onset of the campaign. 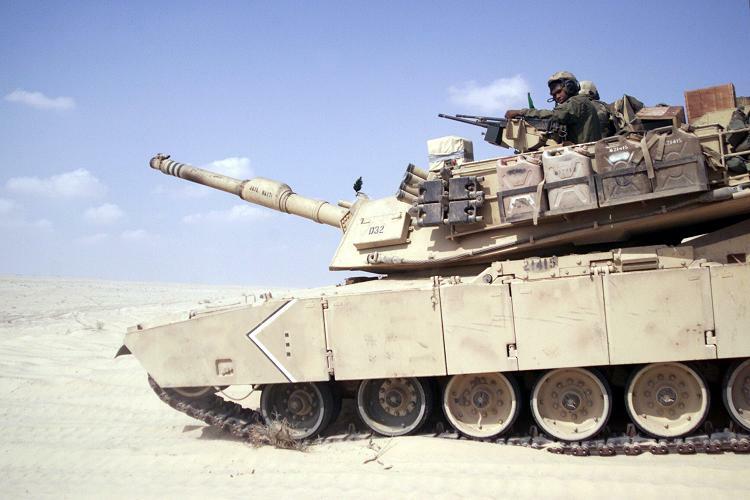 M1A2 tanks uniformly incorporate depleted uranium armor, and all M1A1 tanks in active service have been upgraded to this standard as well, the added protection from the depleted uranium armor is believed to be equivalent to 24 inches of RHA. The strength of the armor is estimated to be about the same as similar western, contemporary main battle tanks such as the Leopard 2. In the Persian Gulf War, Abrams tanks survived multiple hits at relatively close ranges from Iraqi Lion of Babylon tanks and ATGMs. M829A1 “Silver Bullet” APFSDS rounds from other M1A1 Abrams were unable to penetrate the front and side armor (even at close ranges) in friendly fire incidents as well as an incident in which another Abrams tried to destroy an Abrams that got stuck in mud and had to be abandoned. In the chance that the Abrams does suffer damage resulting in a fire in the crew compartment, the tank is equipped with a halon fire-suppression system that automatically engages and extinguishes fires in seconds.Fuel and ammunition are in armored compartments with blowout panels to protect the crew from the risk of the tank’s own ammunition cooking off if the tank is damaged. The main armament of the original model M1 was the M68A1 105 mm rifled tank gun firing a variety of high explosive anti-tank, high explosive, white phosphorus and an anti-personnel (multiple flechette) round. This gun is a license-built version of the British Royal Ordnance L7 gun. While being a reliable weapon and widely used by many NATO nations, a cannon with lethality beyond the 3-kilometer (1.9 mi) range was needed to combat newer armor technologies. To attain that lethality, projectile diameter needed to be increased. The M68A1’s performance in terms of accuracy and armor-piercing penetration is on par with the M256A1 up to 3 kilometers (1.9 mi) out, but beyond that range the 105 mm projectile lacks the kinetic energy to defeat modern armor packages. The main armament of the M1A1 and M1A2 is the M256A1 120 mm smoothbore gun, designed by Rheinmetall AG of Germany, manufactured under license in the United States by Watervliet Arsenal, New York. The M256A1 is a variant of the Rheinmetall 120 mm L/44 gun carried on the German Leopard 2 on all variants up to the Leopard 2A5. Leopard 2A6 replaced the L/44 barrel with a longer L/55.The M256A1 fires a variety of rounds. The M829A2 was developed specifically to address the threats posed by a Soviet T-90 or T-80U tank equipped with Kontakt-5 Explosive Reactive Armor. It also fires HEAT shaped charge rounds such as the M830, the latest version of which (M830A1) incorporates a sophisticated multi-mode electronic sensing fuse and more fragmentation which allows it to be used effectively against armored vehicles, personnel, and low-flying aircraft. The Abrams uses a manual loader, due to the belief that having a crewman reload the gun is faster and more reliable. and because autoloaders do not allow for separate ammunition storage in the turret. The fourth tank crewman on the Abrams also provides additional support for maintenance, observation post/listening post (LP/OP) operations, and other tasks. The new M1028 120 mm anti-personnel canister cartridge was brought into service early for use in the aftermath of the 2003 invasion of Iraq. It contains 1,098 3⁄8-inch (9.5 mm) tungsten balls which spread from the muzzle to produce a shotgun effect lethal out to 600 meters (2,000 ft). The tungsten balls can be used to clear enemy dismounts, break up hasty ambush sites in urban areas, clear defiles, stop infantry attacks and counter-attacks and support friendly infantry assaults by providing covering fire. The canister round is also a highly effective breaching round and can level cinder block walls and knock man-sized holes in reinforced concrete walls for infantry raids at distances up to 75 meters (246 ft). In addition to this, the new XM1111 (Mid-Range-Munition Kinetic Energy) is also in development. Essentially a cannon-fired guided round, it has a range of roughly 12 km and uses a KE warhead which is rocket assisted in its final phase of flight. This is intended to be the best penetrator yet, an improvement over the US 3rd generation DU penetrator (estimated penetration 790 mm (31 in)). A .50 cal. (12.7 mm) M2HB machine gun is in front of the commander’s hatch. 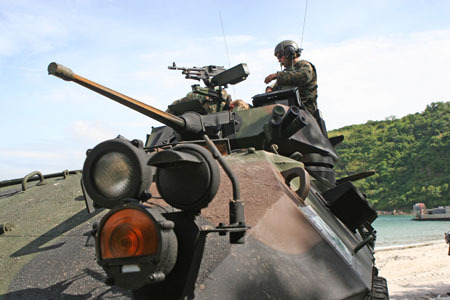 On the M1, M1IP and M1A1, this gun is on a powered mount and can be fired using a 3× magnification sight, known as the Commander’s Weapon Station (CWS for short), while the vehicle is “buttoned up” with all its hatches closed to protect the crew. On the M1A2 & M1A2SEP, this gun is on a flex mount (seen at right), the Commander having to expose himself to fire the weapon manually. With the forthcoming TUSK addon kit, an M2HB or a Mk 19 grenade launcher can be mounted on the CROWS remote weapons platform (similar to the Protector M151 remote weapon station used on the Stryker family of vehicles). The upgrade variant called M1A1 Abrams Integrated Management (AIM) equips the .50 caliber gun with a thermal sight for accurate night and other low-visibility shooting. A 7.62 mm M240 machine gun is in front of the loader’s hatch on a skate mount. Some of these have been fitted with gun shields during the ongoing conflict in Iraq as seen in the image at right, as well as night-vision scopes for low-visibility engagements. A second 7.62 mm M240 machine gun is in a coaxial mount to the right of the main gun. The coaxial MG is aimed and fired with the same computer fire control system used for the main gun. (Optional) A second coaxial 12.7 mm M2HB machine gun can be mounted directly above the main gun in a remote weapons platform as part of the TUSK upgrade kit. For the US Army in previous years, the Abrams usually maintained the provision for storing an M16 rifle or M4 carbine inside the turret in case the crew is required to leave the tank under potentially hostile conditions; while the crewmen were supplied with the M9 Beretta pistol as a personal sidearm. Considering the current (often dismounted) role of American armored crewmen and contemporary operating environments, though, current US Army crews maintain a rifle or carbine for each crewman. 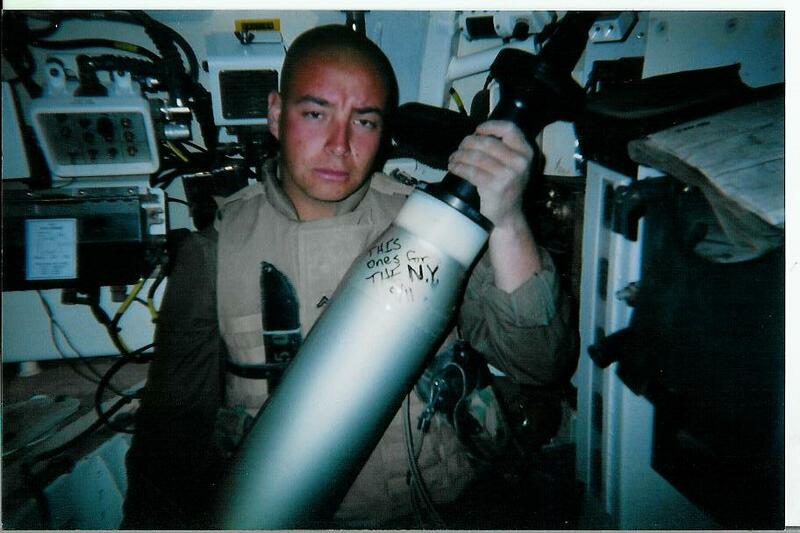 During Iraqi Freedom some crews were also issued M136 AT4 shoulder-fired anti-tank weapons under the assumption that they might have to engage heavy armor in tight urban areas where the main gun could not be brought to bear. 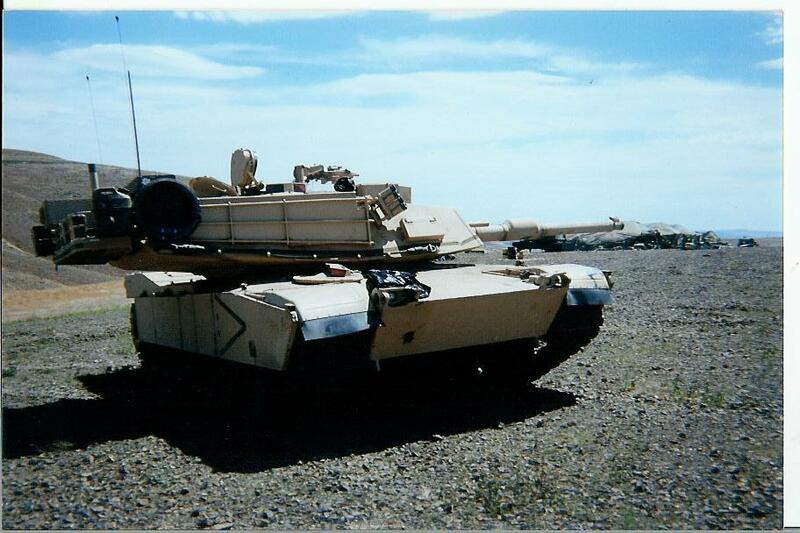 The Abrams is equipped with a ballistic fire-control computer that uses user and system-supplied data from a variety of sources, to compute, display, and incorporate the three components of a ballistic solution – lead angle, ammunition type, and range to the target, to accurately fire the tank. These three components are determined using a YAG rod laser rangefinder, crosswind sensor, a pendulum static cant sensor, data concerning performance and flight characteristics of each specific type of round, tank-specific boresight alignment data, ammunition temperature, air temperature, barometric pressure, a muzzle reference system (MRS) that determines and compensates for barrel droop at the muzzle due to gravitational pull and barrel heating due to firing or sunlight, and target speed determined by tracking rate tachometers in the Gunner’s or Commander’s Controls Handles. All of these factors are computed into a ballistic solution and updated 30 times per second. The updated solution is displayed in the Gunner’s or Tank Commander’s field of view in the form of a reticle in both day and Thermal modes. The ballistic computer manipulates the turret and a complex arrangement of mirrors so that all one has to do is keep the reticle on the target and fire to achieve a hit. 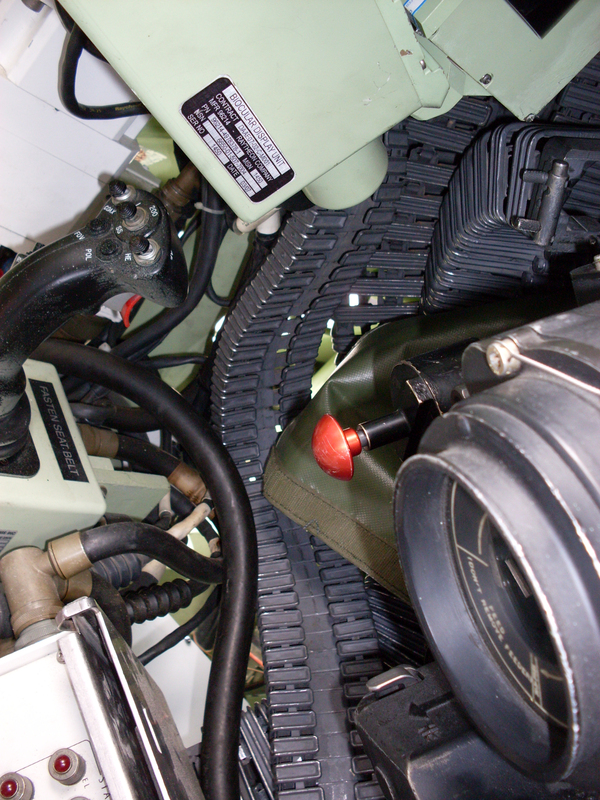 Proper lead and gun tube elevation are applied to the turret by the computer, greatly simplifying the job of the Gunner.The fire-control system uses these data to compute a firing solution for the gunner. The ballistic solution generated ensures a hit percentage greater than 95 percent at nominal ranges. Either the commander or gunner can fire the main gun. 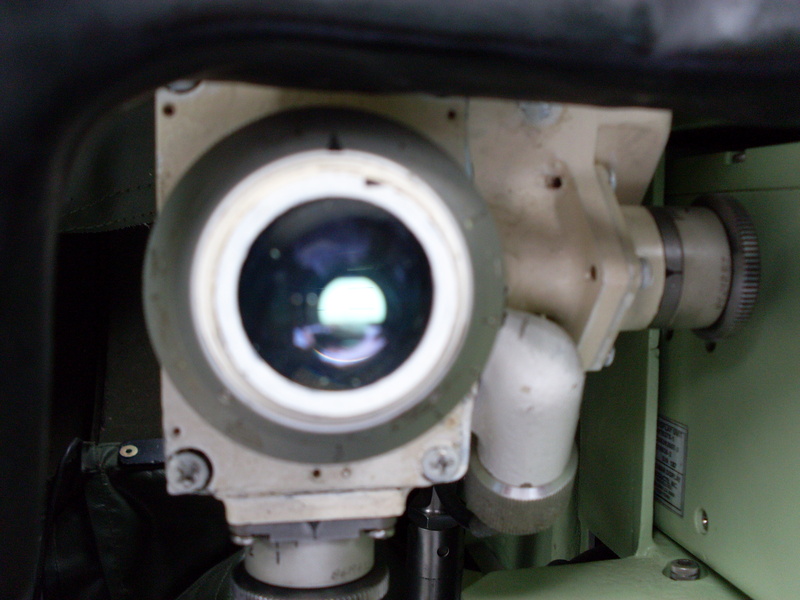 Additionally, the Commander’s Independent Thermal Viewer (CITV) on the M1A2 can be used to locate targets and pass them on for the gunner to engage while the commander scans for new targets. In the event of a malfunction or damage to the primary sight system, the main and coaxial weapons can be manually aimed using a telescopic scope boresighted to the main gun known as the Gunner’s Auxiliary Sight (GAS). The GAS has two interchangeable reticles; one for HEAT and MPAT (MultiPurpose AntiTank) rounds and one for APFSDS and STAFF (Smart Target-Activated Fire and Forget) ammunition. Turret traverse and main gun elevation can be accomplished with manual handles and cranks in the event of a Fire Control System or Hydraulic System failure. The commander’s M2 .50 caliber machine gun on the M1 and M1A1 is aimed by a 3x magnification sight incorporated into the Commander’s Weapon Station (CWS), while the M1A2 uses either the machine gun’s own iron sights, or a remote aiming system such as the CROWS system when used as part of the TUSK (Tank Urban Survival Kit). The loader’s M240 machine gun is aimed either with the built-in iron sights or with a thermal scope mounted on the machine gun. The M1 Abrams is powered by a 1,500 shaft horsepower (1,100 kW) Honeywell AGT 1500 (originally made by Lycoming) gas turbine, and a six speed (four forward, two reverse) Allison X-1100-3B Hydro-Kinetic automatic transmission, giving it a governed top speed of 45 mph (72 km/h) on paved roads, and 30 mph (48 km/h) cross-country. With the engine governor removed, speeds of around 60 mph (97 km/h) are possible on an improved surface; however, damage to the drive train (especially to the tracks) and an increased risk of injuries to the crew can occur at speeds above 45 mph (72 km/h). The tank for all intents and purposes was built around this engine. The tank can be fueled with diesel fuel, kerosene, any grade of motor gasoline, JP-4 jet fuel, or JP-8 jet fuel; the US Army uses JP-8 jet fuel in order to simplify logistics. The Royal Australian Armoured Corps’ M1A1 AIM SA uses diesel fuel; it is cheaper and makes practical sense for Australian military logistics. Driving controls the gas turbine propulsion system has proven quite reliable in practice and combat, but its high fuel consumption is a serious logistic issue (starting up the turbine alone consumes nearly 10 US gallons (38 l) of fuel). The engine burns more than 1 US gallon (3.8 l) per mile and 12 US gallons (45 l) per hour when idle. 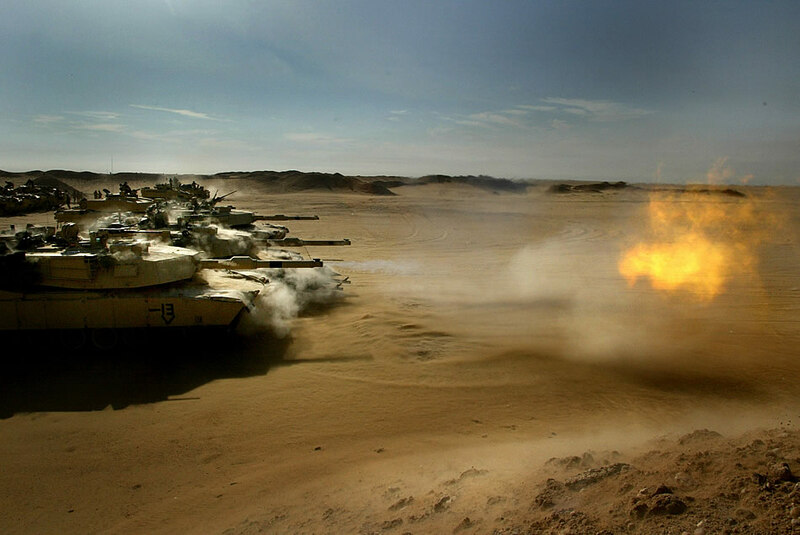 The high speed, high temperature jet blast emitted from the rear of M1 Abrams tanks makes it difficult for the infantry to proceed shadowing the tank in urban combat. The turbine is very quiet when compared to diesel engines of similar power output and produces a significantly different sound from a contemporary diesel tank engine, reducing the audible distance of the sound, thus earning the Abrams the nickname “whispering death” during its first REFORGER exercise. Honeywell was developing another gas turbine engine with General Electric for the XM2001 Crusader program that was also to be a replacement for the AGT-1500 engine already in the Abrams tank. The new LV100-5 engine is lighter and smaller (43% fewer parts) with rapid acceleration, quieter running and no visible exhaust. It also features a 33% reduction in fuel consumption (50% less when idle) and near drop-in replacement. The Abrams-Crusader Common Engine Program was shelved when the Crusader program was canceled, however Phase 2 of Army’s PROSE (Partnership for Reduced O&S Costs, Engine) program calls for further development of the LV100-5 and replacement of the current AGT-1500 engine. Future US tanks may return to reciprocating engines for propulsion, as 4-stroke diesel engines have proven quite successful in other modern heavy tanks, e.g. the Leopard 2, Challenger 2 and Merkava.Using a high power density 330 cc (20 cu in) Wankel rotary engine modified to use diesel and military grade jet fuel, TARDEC developed a 220-pound (100 kg) Auxiliary Power Unit designed to fit into the M1 Abrams, replacing an existing battery pack that weighs about 500 pounds (230 kg). The new APU will also be more fuel efficient. The installation of the first APUs is expected to start in 2009. 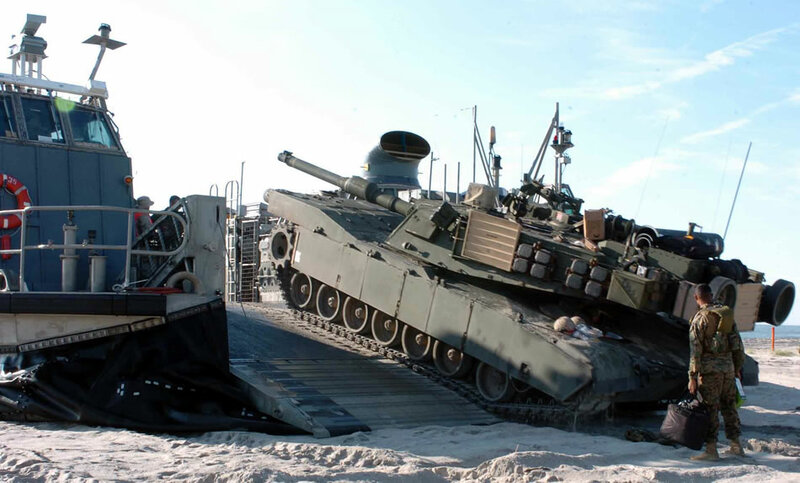 A provision exists that the Abrams be able to transport passengers in tank desant with the turret stabilization device off. One Infantry squad carrying only their battle gear may ride the rear of the turret. 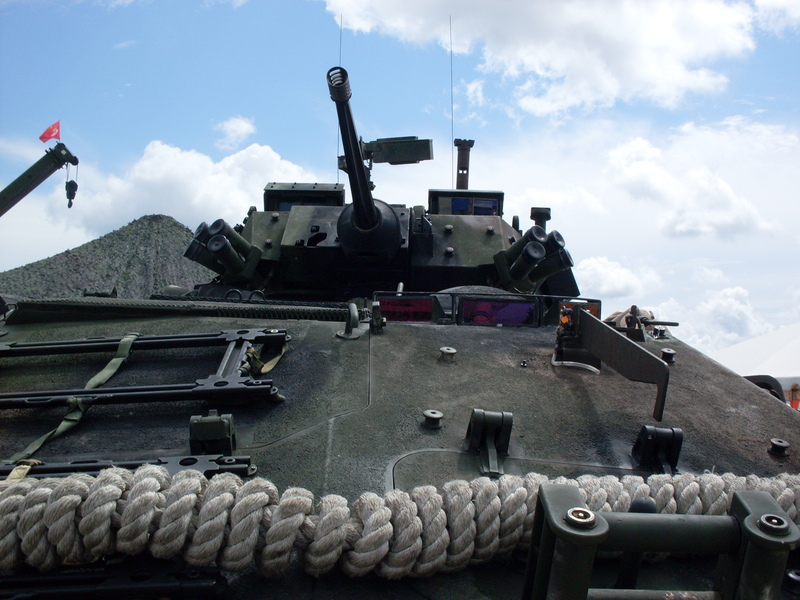 The soldiers have the option of using ropes and equipment straps as a field-expedient Infantry rail to provide handholds and snap links to secure themselves to the turret. The Squad leader, team leaders, grenadiers sit on the left and right sides of the turret, while the riflemen, and automatic riflemen sit at the rear. If and when enemy contact is made, the tank conceals itself allowing the infantry to dismount. Strategic mobility is the ability of the tanks of an armed force to arrive in a timely, cost effective, and synchronized fashion. The Abrams can be carried by a C-5 Galaxy or a C-17 Globemaster III. 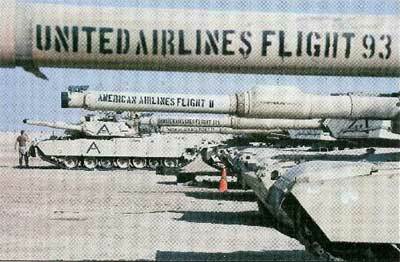 The limited capacity (two combat-ready in a C-5, one combat-ready tank in a C-17) caused serious logistical problems when deploying the tanks for the First Gulf War, though there was enough time for 1,848 tanks to be transported by ship.The Abrams is also transportable by truck, namely the M1070 Heavy Equipment Transporter (HET). The HET can operate on highways, secondary roads, and cross-country. The HET accommodates the 4 tank crewmen. The Tank Urban Survival Kit (TUSK), is a series of improvements to the M1 Abrams intended to improve fighting ability in urban environments. Historically, urban and other close battlefields have been the worst place for tanks to fight—a tank’s front armor is much stronger than that on the sides, top, or rear, and in an urban environment, attacks can come from any direction, and attackers can get close enough to reliably hit weak points in the tank’s armor, or get sufficient elevation to hit the top armor square on.Armor upgrades include reactive armor on the sides of the tank and slat armor (similar to that on the Stryker) on the rear to protect against rocket-propelled grenades and other shaped charge warheads.A Transparent Armor Gun Shield and a thermal sight system are added to the loader’s top-mounted M240B 7.62 mm machine gun, and a Kongsberg Gruppen Remote Weapon Turret carrying a .50 caliber machine gun (again similar to that used on the Stryker) is in place of the tank commander’s original .50 caliber machine gun mount, wherein the commander had to expose himself to fire the weapon manually. An exterior telephone allows supporting infantry to communicate with the tank commander.The TUSK system is a field-installable kit that allows tanks to be upgraded without needing to be recalled to a maintenance depot.While the reactive armor may not be needed in most situations in maneuver warfare, items like the rear slat armor, loader’s gun shield, infantry phone (which saw use on Marine Corps M1A1s as early as 2003), and Kongsberg Remote Weapons Station for the .50 caliber machine gun will be added to the entire M1A2 fleet over time. On August 29, 2006, General Dynamics Land Systems received a US Army order for 505 Tank Urban Survivability Kits (TUSK) for Abrams main battle tanks supporting operations in Iraq, under a US$45 million contract. 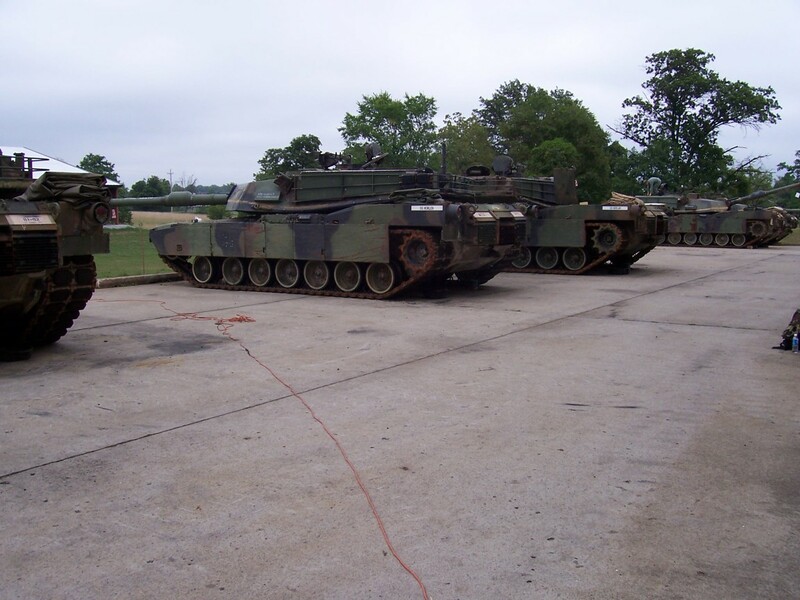 The add-on kit will be provided for M1A1 and M1A2-series tanks to enhance crew survivability in urban environments. 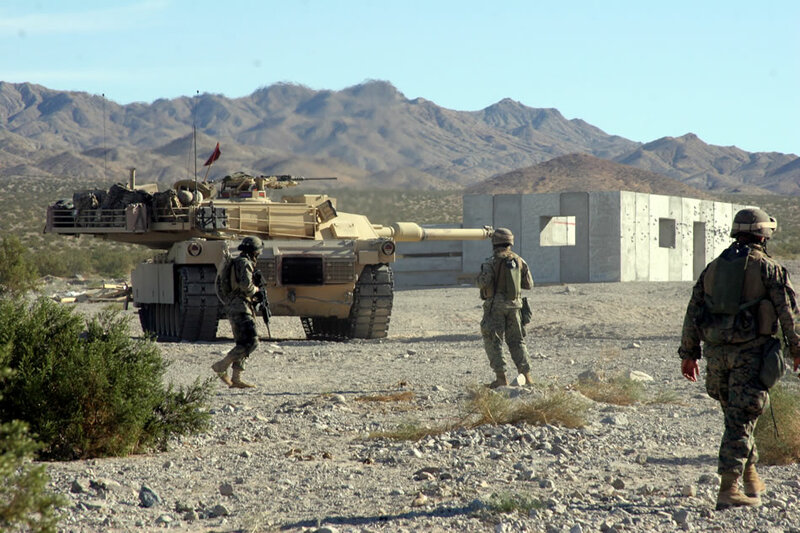 The kit ordered by the Army consists of a Loader’s Armor Gun Shield (LAGS), a Tank Infantry Phone (TIP), Abrams Reactive Armor Tiles (ARAT), a Remote Thermal Sight (RTS) and a Power Distribution Box (PDB). Deliveries are expected to be complete by April 2009. Under a separate order, the US Army awarded General Dynamics Armament and Technical Products (GDATP) US$30 million to produce reactive armor kits to equip M1A2. The total contract value could reach $59 million if all contract options are exercised. The reactive tiles for the M1 will be locally produced at GDATP’s Burlington Technology Center. Tiles will be produced at the company’s reactive armor facility in Stone County Operations, McHenry, Miss. On December 8, 2006 the U.S. Army added Counter Improvised Explosive Device enhancements to the M1A1 and M1A2 TUSK, awarding GDLS U.S. $11.3 million, part of the $59 million package mentioned above. In December GDLS also received an order amounting about 40% of a US$48 million order for loader’s thermal weapon sights being part of the TUSK system improvements for the M1A1 and M1A2 Abrams Tanks. Australia – 59 M1A1SA (hybrids, mix equipment used by US.Army tanks and U.S.M.C. tanks, without DU layers in armor) tanks were bought from the United States in 2006, to replace the Leopard AS1 in 2007. Egypt – 1005 M1A1 (downgraded, without DU layers in armor) tanks co-produced by the USA and Egypt for the Egyptian army. 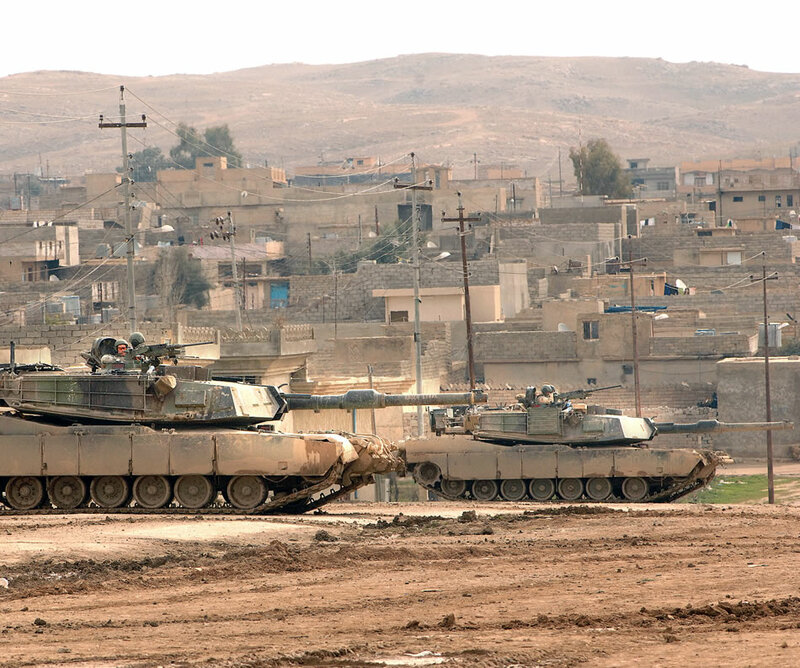 Iraq – 140 M1A1M’s (downgraded, without DU layers in armor) on order, to be delivered by 2011. Currently 22 US.Army M1A1’s are leased for training. United States – Approximately 6,000 M1A1 and M1A2 variants including both Army and Marine Corps inventory + 3268 M1 and M1IP variants, not used in storage, waiting for upgrade to M1A2SEP variant (most of them) or rebuild to specialised vehicles. 4,393 M1A1 variants (Army inventory). Under upgrade process to M1A1SA variant. 403 M1A1HC’s variants (Marine Corps inventory). Under upgrade process to M1A1FEP.